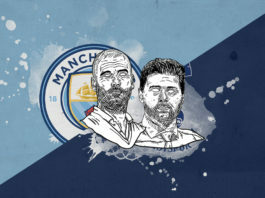 Home Match Analysis Tactical Preview Can Solskjaer’s Manchester United revolution start conquering Europe? 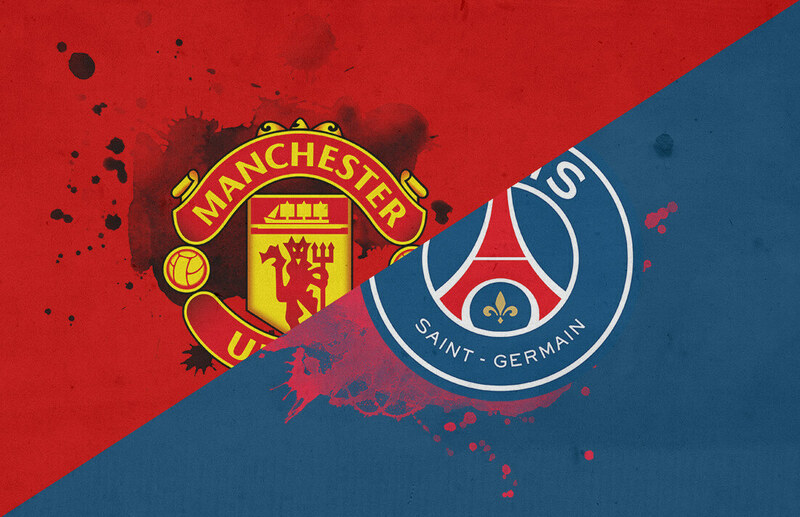 Manchester United take on Paris Saint-Germain in a mouth-watering clash at Old Trafford this week with European action returning, much to the relief of the fans around the world. This matchup was expected to be an easy tie for PSG when the draw was initially made. The Parisians were relishing the opportunity to face a declining Manchester United side in what was being considered a straight forward encounter given the circumstances. However, what a difference a few weeks makes. A few injuries and a managerial change later, the tides have turned and PSG face the real prospect of being knocked out by a rampant Manchester United side rejuvenated by club legend and interim manager Ole Gunnar Solskjaer. Neymar and Marco Verratti’s injury problems have hindered Les Parisiens chances and the latter’s absence has caused an imbalance in central midfield in recent weeks. Such have been their problems in central midfield that Julian Draxler and Dani Alves have been played as makeshift central midfielders of late, while Marquinhos has continued his role in defensive midfield. Although he is proving to be more than capable in his newly adopted home, the January acquisition of Leandro Paredes will come as a relief. His presence alleviates some pressure off Thomas Tuchel giving him another natural midfield option. However, after missing out on targets such as Julian Weigl, Idrissa Gueye and Frenkie De Jong, Tuchel will have to be reliant on Verratti and Leandro Paredes staying fit for the remainder of the season. This clash promises to be an exciting encounter and a closely contested tie. Manchester United have found a lease of life with Marcus Rashford scoring for fun, Anthony Martial finally finding consistency and Jesse Lingard thriving in his new false nine role. The team’s attacking trident has rediscovered themselves under the Norwegian. Arguably the biggest change at Manchester United has been the reemergence of Paul Pogba who has regained the form that made moved him from Turin to Manchester. 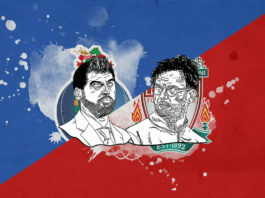 In this article, I will look to pinpoint the different tactical aspects that will be crucial to the outcome of this first leg. Manchester United will look to use a 4-3-1-2 formation. One of the biggest changes under Ole Gunnar Solskjaer has been the attacking freedom given to the team to express themselves. Jesse Lingard will play as the false nine being supported by Anthony Martial and Marcus Rashford. The trio has tormented defences with their intelligent movement and pace giving defenders a torrid time in predicting their movements in recent weeks. Luke Shaw and Ashley Young have attacked with a lot more freedom supporting the three strikers but this has left a hole in behind the full-backs giving opposition teams an area to exploit. Ander Herrera will have the most important role as the midfield lynchpin by tracking midfield runs and pinching the ball off the likes of Kylian Mbappé and limiting the influence of Marco Verratti. Paris Saint-Germain face similar issues when it comes to wing-backs leaving space in behind. Dani Alves, Juan Bernat and Layvin Kurzawa excel at bombing forward but struggle defensively. Thomas Tuchel’s aim is the creation of overloads out wide. The key to this is to allow the wing-backs to push up and wide and the midfield runners to come in support. 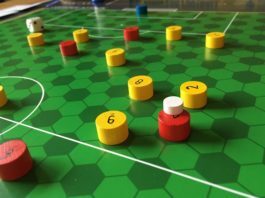 Executing this tactic would result in either the ball-carrying player having a crossing or shooting opportunity, or pulling it back for one of the attacking midfielders in space. If Kurzawa is fit to play, he should get the nod over Bernat at left-wing back given his creativity and attacking play. Bernat, who was at fault for Lyon’s equalising goal last week, may give way. Thomas Meunier and Edinson Cavani suffered injuries against Bordeaux over the weekend and will miss out the mid-week clash. Meunier could have slotted into right-wing back given Manchester United’s strength in the wide areas but now Dani Alves will come in. Menuier gives PSG better defensive assurances and thus a better balance. However, Tuchel could decide to move Thilo Kehrer to right wing-back and bring Marquinhos into central defence. The news of Cavani’s injury will be a massive blow for Tuchel knowing his only senior striker is unavailable. With all due respect to Eric Maxim Choupo-Moting, the skill set the Uruguayan brings cannot be replicated, but Tuchel may have to start the former Schalke and Stoke striker. PSG will look to set up in a 3-5-2 formation to seemingly allow further protection in the away leg. Tuchel will want added protection defensively whilst allowing his wing-backs to attack and support Ángel Di María and Kylian Mbappé. The midfield battle is where the tie will be won and lost. The team capable of efficiently controlling the midfield will hold the advantage to the outcome of the tie. Paul Pogba is expected to partner Nemanja Matic and Ander Herrera as Manchester United will be looking for the numerical advantage and to use Matic and Herrera to nullify the attacking threat posed by Les Parisiens. Marcus Rashford, Jesse Lingard and Anthony Martial will be reliant on Paul Pogba to supply them with the firepower needed to score goals. Lingard’s move to false nine allows all three players to interchange roles making it difficult for defenders to predict their movements. The relationship between Pogba and the forwards has been much improved. The efficiency shown has greatly benefited the French midfielder to help him show the form he displayed at Juventus. His relationship with Rashford is a particular highlight and has become a dangerous combination for Manchester United. Under Solskjaer, Manchester United has been prevalent in attack with Pogba leading the charge from midfield. The interim coach has tweaked his tactics to allow Pogba more space to bomb forward and make late runs into the box whilst Rashford, Martial and Lingard shift focus to themselves. Here we see Anthony Martial taking on two Brighton defenders with Pogba in space just outside of the 18-yard area. Martial’s movement allows Pogba to run in unnoticed and interchange passes with Martial who scores an exquisite goal. It was the combination with the forward that plays to Pogba’s strength, giving him the space to both run into and use his intelligent passing ability. Paris Saint-Germain will need to be wary of Pogba’s threat combined with the forwards. Paul Pogba’s relationship with Marcus Rashford has been a raging success with the two combining on multiple occasions in recent weeks. Pogba’s qualities involve his range of passing, carrying the ball over long distances and off-the-ball movement. Just like Kylian Mbappé unlocked Pogba at the World Cup, Rashford has had a similar effect at Manchester United. 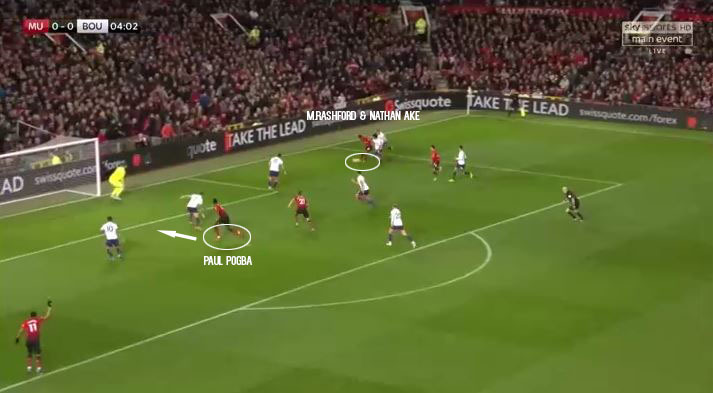 Rashford’s positioning and movement are impeccable and allow Pogba to launch accurate deliveries into his path knowing that Rashford will latch onto the pass. This allows Pogba to make his own trademark run into the opposition’s penalty area and wreak havoc. The Premier League match against Bournemouth showed us how Pogba’s runs can be a cause for concern for Paris Saint-Germain. As Manchester United play out from the back, Ashley Young plays a long pass down the wing to Rashford who is one-on-one with Nathan Ake. After evading the Dutch defender’s challenge he escapes Diego Rico’s attentions too. Every Bournemouth player is fixated on Rashford, but the ball to Pogba allows the Frenchman a free run into the six-yard area to score a tap-in. Les Rouge-et-Bleu were sweating on the fitness of Marco Verratti who hadn’t trained prior to the match against Bordeaux, but the Italian managed to play a significant portion of the match. His potential absence would have heaped pressure on Leandro Paredes to take control alongside Marquinhos and Julian Draxler. Christopher N’Kunku could be a surprise inclusion from Thomas Tuchel if he decides to play with an attacking and defensive double pivot combination with Marquinhos if he deems Verratti unfit to play another 90 minutes. Verratti’s ability to dictate games and control tempo will be a key component in controlling the outcome of the tie. Putting in a healthy Verratti will be of the utmost importance for Tuchel and PSG. Adrien Rabiot’s off-field issues have hurt them too given his useful skillset. The Parisians will need to be effective in possession and make sure they utilize the ball efficiently by transitioning it quickly to the forwards and wing-backs. The inclusion of Leandro Paredes and Verratti should provide the attacking players with an effective outlet. 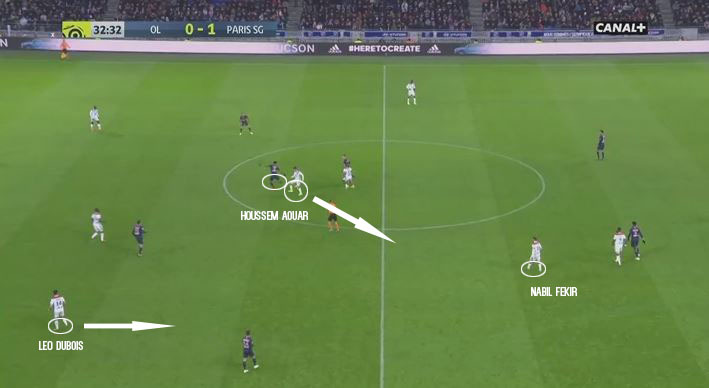 An area of strength for PSG is the wing-back area. The two wing-backs will be critical for both sides but particularly for Les Rouge-et-Bleu as their wingers do not provide width. Tuchel will want his wing-backs to make marauding runs to push the opposition wingers and wing-backs into defensive positions giving them a greater impetus out wide. Here you can see how PSG transition the ball from midfield to the wide areas as they enter the final third. Dani Alves is positioned wider than Draxler and is in space to play a cross in for the late runs from midfield. While this is an area of strength from an attacking point of view, defensively both teams have weaknesses here with the space left in behind. 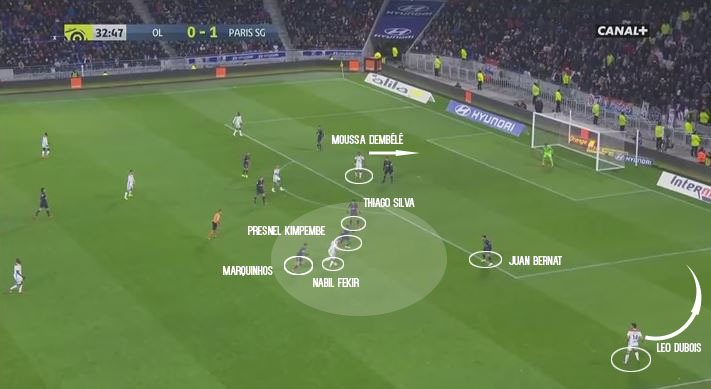 We saw Lyon exploit PSG last week and use the space in behind Juan Bernat and Dani Alves to good effect when the midfield wasn’t fully switched on. Marquinhos did an adequate job as a half-back but was not able to stop Fekir and his charges from exploiting the spaces. Jesse Lingard will look to occupy Thilo Kehrer and Thiago Silva while Mbappe will look to replicate the same with Eric Bailly and Victor Lindelof. The wingers and wing-backs will be left isolated with their counterparts. As we saw against Burnley and Arsenal, Manchester United do struggle against overloads in the wide areas. Against Arsenal in their recent FA Cup victory, United were caused problems by Arsenal’s wing-backs and winger combination. Sead Kolasinac and Alex Iwobi combined with Aaron Ramsey to produce a well-worked goal for Pierre-Emerick Aubameyang. Once Iwobi receives the ball, Young is locked in a one-on-one situation against the Nigerian winger. He moves infield and drags Young out of position giving Ramsey the outer space to occupy and receive the ball. 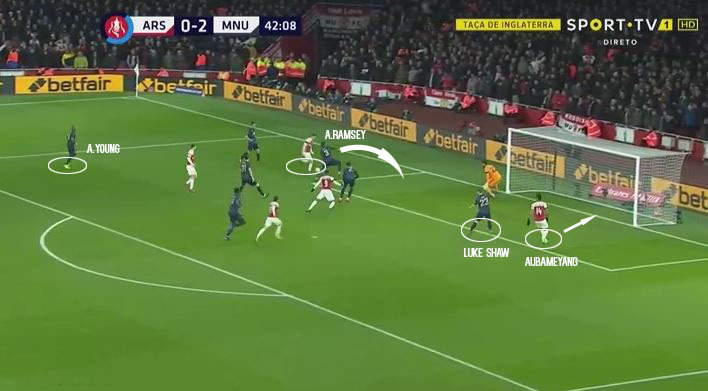 Ramsey is then able to dribble in behind the Manchester United defensive line and manages to cross the ball towards Aubemeyang who is not marked diligently by Luke Shaw. Just how Aaron Ramsey’s run has created an overload for Arsenal, Paul Pogba can have the same effect on PSG’s defence. He is a willing runner who has the composure and intelligence to know where space is available just as Nabil Fekir and Léo Dubois did to PSG to devasting effect. Lyon’s first goal started off with the midfield double pivot pressing hard and winning it early in midfield. Aouar wins the tackle and initiates a counter-attack putting Lyon on the offensive. As they transition from midfield to attack through Nabil Fekir and Léo Dubois, Fekir looks to drift infield and drag Marquinhos, Presnel Kimpembe and Thiago Silva out of position. Juan Bernat is caught ball-watching and leaves Dubois free on the right wing. Fekir plays it out wide to Dubois who delivers a cross for Moussa Dembélé to overpower Alphonse Areola and score. Manchester United will be looking at Ander Herrera to track the runs just like the one made by Nabil Fekir in the example above and cover both full-backs with Matic acting as the anchor-man. Neymar’s absence has altered the dynamic of the overall tie. In 23 games the eccentric forward has contributed 20 goals and 11 assists. Replacing that sort of firepower is almost impossible but in Kylian Mbappé PSG have a natural successor to the throne. In 26 games Mbappé has contributed 22 goals and 14 assists which have kept PSG afloat. The Brazilian’s dynamism, big-game mentality and consistency along with his goals and assists will still be sorely missed. In 50 matches with PSG, Neymar has scored 45 goals and recorded 24 assists which have resulted in an incredible 42 wins and four losses. His influence is undeniable, but in Mbappé PSG do have a ready-made replacement alongside the likes of Ángel Di María and Julian Draxler. Leandro Paredes played his first 90 minutes for PSG last week against Villefranche in the French Cup and put in an assured display alongside Julian Draxler in midfield. 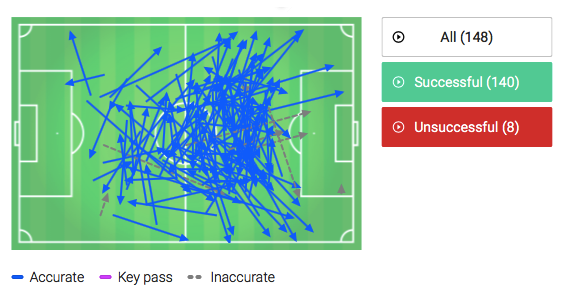 The Argentine midfielder played 148 passes and completed 140 with a variety of passing styles. His inclusion will bring relief to a midfield that has struggled to impose themselves over the past few games, and allow the attacking threat of Ángel Di María and Julian Draxler to flourish further upfield. Paredes has an 87.4% pass success rate and attempts 61.81 passes per game. Those numbers should improve as PSG are far more dominant than the rest of Ligue 1. We’ve seen glimpses of his potential during his stint at Roma. Playing with better quality players in Europe should vastly improve the 24-year-old, especially given his midfield partner will be Marco Verratti. The combination of Verratti, Paredes, and Marquinhos can become a long-term solution providing the Parisians with balance, creativity, and guile. Both sides will want a positive result to take into the second leg and gain momentum going into a busy February. Manchester United take on PSG, Chelsea, and Liverpool in what is a monumental month for the Red Devils. A win over PSG will give them the confidence to go to the Parc des Princes and come away with a victory and advance to the quarter-final. PSG, on the other hand, will look to sneak a win but will be satisfied with a scoring draw giving them the away goal advantage for the second leg. Having a fully fit Marco Verratti available for selection for the return leg will be significant given he has only just returned from injury. I believe this will be a tight-knit affair, but with Manchester United’s upturn in form and PSG losing Neymar and a less than 100% Verratti for this tie, I think a narrow 2-1 victory to Manchester United is a very possible result. Don’t be surprised with a scoring draw either. One thing is guaranteed, this match will be full of goals. Next articleHow did Makoto Hasebe roll back the years to frustrate RB Leipzig?